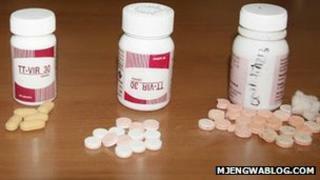 An investigation into the circulation of fake HIV drugs in Tanzania could lead to criminal prosecutions, the health minister has told the BBC. Dr Hussein Mwinyi has suspended three top officials and stopped local production of the anti-retrovirals (ARVs) while the probe takes place. He told the BBC Swahili Service he would "not allow people to play around with the lives of Tanzanians". He said the police force and security services were involved in the probe. Analysts say there is concern about the quality of locally made drugs given widespread corruption in political circles in the East Africa nation. Earlier this year, a body overseeing public finances exposed rampant misuse of public funds, including in the health ministry. The scandal led to the sacking of seven ministers. Dr Mwinyi said the health ministry was alerted in August to problems with a batch of ARV drugs at the Tarime District Hospital. The batch, produced by the Tanzania Pharmaceutical Industry (TPI), was immediately recalled and subjected to further testing, which revealed that it was sub-standard. The officials who were suspended on Wednesday work at the Medical Stores Department (MSD) and the production of all drugs by TPI has been halted while investigations are under way, the government-owned paper Tanzania Daily News reports. The minister said out of 12,000 bottles in the fake ARV batch, 9,570 had so far been successfully recalled. In an interview with the BBC's Focus on Africa programme, Dr Mwinyi said health professionals had been ordered to contact all patients taking ARVs to check their medication and do further testing in case anyone had been affected. He said the early detection of this problem and the recall of the drug should ease patients' concerns. "The remaining anti-retrovirals are of good quality - and we are certain of that - and we want to assure them that they should not fear anything," he said. He said the investigation may show that more people are involved in the case. "This investigation is not only [being] done by the Tanzania Food and Drug Authority but by the police force and the other security organs - the reason is that if there is a criminal element in it they should take legal action," he told the BBC. According to UN statistics, an estimated 1.4 million Tanzanians are HIV positive out of a population of 45 million. They are entitled to free ARV treatment, with donors helping fund the government scheme.